Grenzach-Wyhlen, Germany – In July 2015, BAUER Resources GmbH was awarded a contract by Roche Pharma AG for the remediation of perimeter 1/3 NW of the former Kesslergrube landfill. The primary task for BAUER Umwelt GmbH, the subsidiary of BAUER Resources GmbH specialized in the remediation of contaminated sites, is to excavate and collect approximately 280,000 tonnes of soil in special safety containers and haul away these containers. The contaminated excavated material will then undergo thermal treatment. “The remediation of Kesslergrube is the largest single contract in the history of the BAUER Group,” explains project manager Dr. Stefan Haaszio. Managing the project is a once in a lifetime experience for him and a great chance because projects of this size are extremely rare. 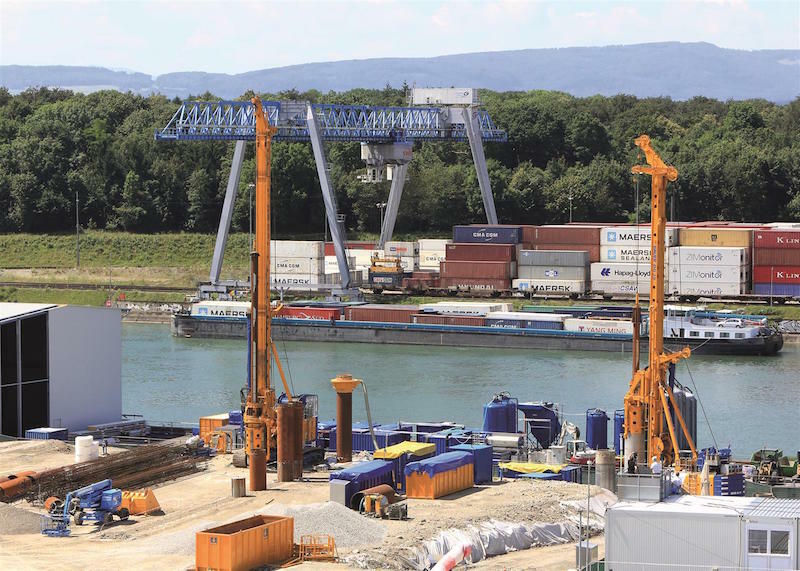 In August 2015, site mobilization and the construction of a temporary pier began. At the beginning of July of this year, sister company BAUER Spezialtiefbau GmbH finally started drilling the large diameter boreholes for soil replacement and the excavation pit. Three Bauer BG 39 rotary drilling rigs are being used for this. For the up to 15 meter deep replacement bores, one of the drilling rigs has been placed directly at the boundary to the adjoining perimeter 2. Here, two rows of replacement bores are to be backfilled with cut-off wall slurry. An additional row in front of the actual retaining wall is to be backfilled with gravel. The drill cuttings are collected in special containers located in the specially erected loading hall equipped with an exhaust air treatment system and transported away to the railway terminal in Weil am Rhein from where they are taken to the disposal site. A mixing plant has been set up at the construction site for filling the replacement bores with cut-off wall slurry. Upon completion of the bored pile wall, work begins for the upper sealing of the retaining wall, the top bar. This load-distributing reinforced concrete bar is needed to absorb the forces that arise from the retaining structure and stiffener steel casings during subsequent deep excavation. The top bar also forms the basis for the housing to be built before deep excavation. The drilling work entails significant efforts in terms of occupational safety and emission protection. All workers in the immediate vicinity of the contaminated cuttings are provided with self-contained breathing apparatus. 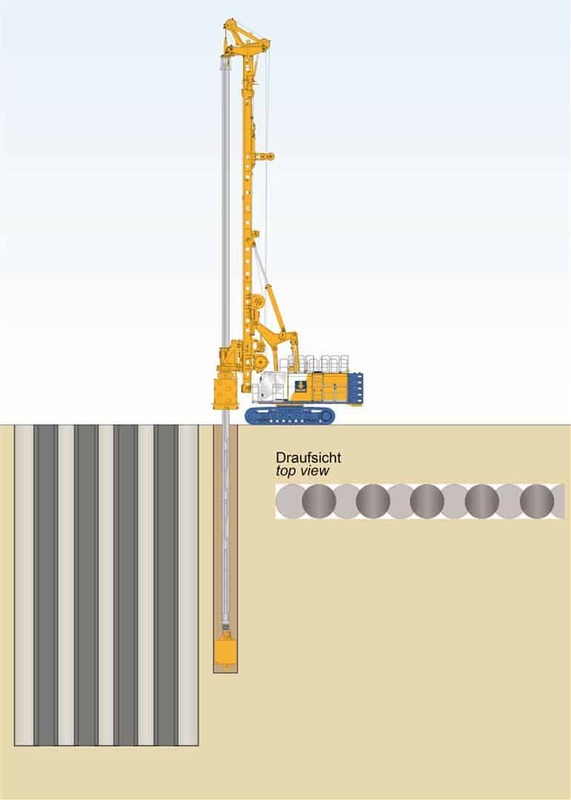 Emissions produced by the drilling process are minimized by a borehole extraction system. Through the use of a covered bucket on the wheel loaders, the drill cuttings are kept securely locked up until they reach the loading hall equipped with an extractor where they are put in special gas-tight and accident-proof containers which are sealed immediately once filled.